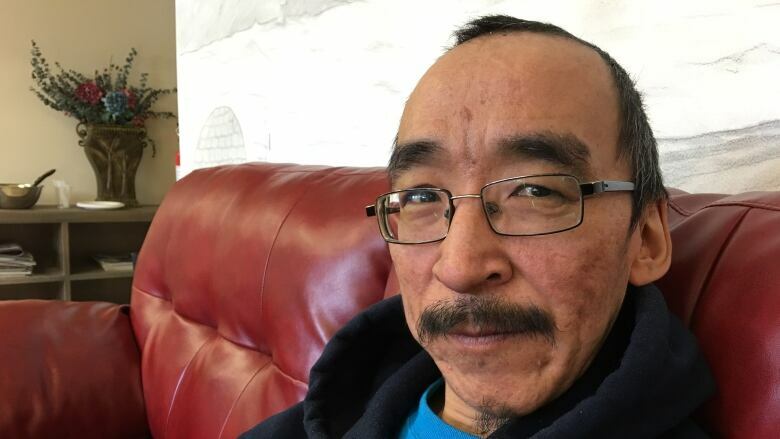 Despite working full time at a grocery store in Cambridge Bay, Nunavut, Donny Angulalek is one of eight men living in a new homeless shelter. A housing shortage in the hamlet is so dire, the shelter is already planning to expand its operations. Couch-surfing from place to place is something Donny Angulalek hopes he never experiences again. "You are in the way, a burden to other people," says the 43-year-old Inuk man who, despite working full time at a grocery store in Cambridge Bay, Nunavut, is living in a homeless shelter. For the first time in five years, Angulalek knows he'll get a hot meal and a warm bed every night. "Things are looking up. At least someone out there cares for the homeless," he says. He's one of eight men, aged 30 to 70, living at a new men's shelter, Omingmak Centre, which opened in February. The hamlet decided to take a housing-first response to help the growing number of homeless men in Cambridge Bay. It's only the second of its kind in the territory — Iqaluit also has a men's shelter. Cambridge Bay, with a population around 1,700, is the latest community in Nunavut to address the territory's persistent housing crisis. 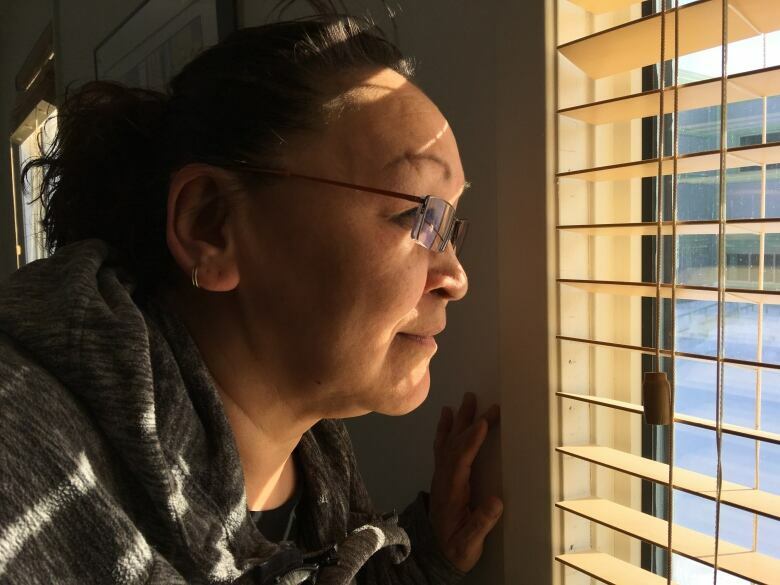 Nunavut's Housing Corporation estimates more than $1 billion worth of housing is needed to meet the territory's current housing needs. As of last year, the corporation listed Cambridge Bay, the hub of the Kitikmeot region, as in "critical need." Unlike in southern centres, it's not always obvious who has a home and who doesn't in Cambridge Bay. "You hear these incredible stories of 15, 20 people in a three-bedroom house," says Marla Limousin, the hamlet's senior administrative officer. "People have been living in cabins or even lean-tos." As of March 2017, 90 families and individuals were on wait lists for the hamlet's 266 units, according to the housing corporation. Cambridge Bay is slated to get 25 more units over the next few years. A housing unit opens up on average every two to three months — some people have been waiting up to 10 years. Just months after the homeless shelter opened, there's already a wait list. Now the shelter is expanding — doubling the number of beds to 16 next year. "It's a drop of water in a pool," Limousin says. "If we can solve homelessness, we can start moving ahead on the other issues that are affecting a lot of community residents." 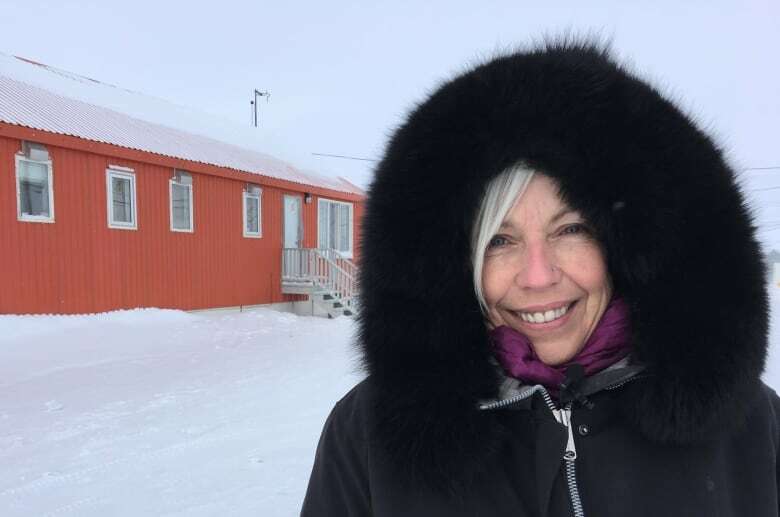 Anne Isnor, who grew up in Cambridge Bay, is the family violence co-ordinator for the hamlet's wellness centre and is temporarily running the Omingmak Centre. She says single men are often at the bottom of the wait lists for public housing. Right now, 35 applicants are waiting for one-bedroom units in Cambridge Bay, according to the housing corporation. Isnor says homeless men in Cambridge Bay also struggle with addictions and mental health issues. Some cycle in and out of jail, others have been kicked out of a family home because of violence, while others are escaping violence. Many people are forced to couch surf, some ending up in party homes. "I lost a few jobs staying on someone's couch," says Angulalek. Isnor sympathizes with the homeless men. "They have hearts. They are human," Isnor says. "We have men that are working, and you see them struggle, because it's hard for them to get a house." The Omingmak Centre, a converted hamlet staff house, is bright and cozy. Two rooms house bunk beds; there's a laundry facility on site, common room and kitchen. Shelter staff cook hot dinners and breakfast every weekday. The men take over cooking and cleaning on the weekends. "They can even learn to cook, even boil hot dogs," laughs Isnor, who says learning basic life and job readiness skills are all part of getting the men back on their feet while they wait for housing. No alcohol or drugs are allowed. 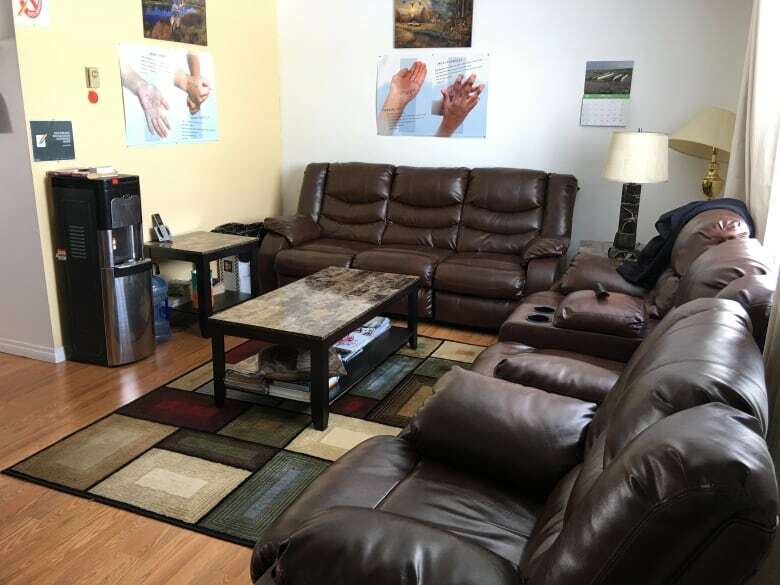 The men also have access to counselling and addiction programs at the community wellness centre. For Angulalek, that support has made all the difference. "That alcohol is pretty bad. It makes you think crazy and don't care about anything," he says. "But I am starting to say 'no.'" 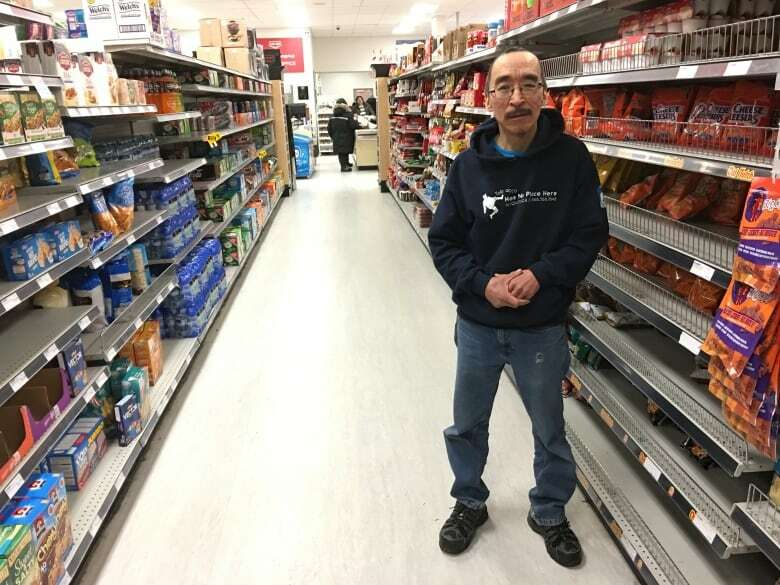 Angulalek's job stocking shelves at Cambridge Bay's Co-op grocery store is the first steady full-time work he's been able to keep in years. "No worry about having an empty stomach," he smiles, while stocking ice cream. "I can keep employment, have a steady place to go home to, a sober place." And he can focus on getting healthy. "What does everyone want?" he says. "I want a good life."